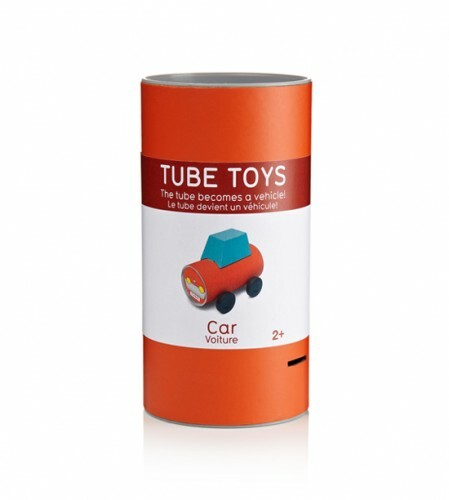 The ‘Tube Toys' are a series of vehicles to assemble were the packaging is also part of the product, reducing considerably the amount of material discarded after purchase, and the added cost that traditional packaging involves. All the parts needed to built each vehicle are contained on a standard cardboard tube which doubles as the packaging and becomes the body of the car, fire engine, train or tractor. Each tube has pre-cut slots and holes to place the wheels axes and other components. A single stripe of paper displaying all the information needed for the shop ( brand, logo, product name/description and barcode ) is the only bit that will be discarded after purchase. All the materials used on the product are also recycled and/or recyclable.